From Jean Delannoy, one of France's foremost filmmakers, comes this top quality feature film production of the story of St. Bernadette and the apparitions of Our Lady of Lourdes. 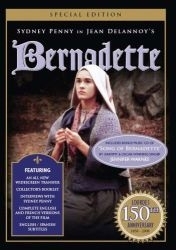 Actress Sydney Penny gives a beautiful performance as Bernadette, and the rest of the cast is equally superb. Also stars Roland Lesaffre and Michele Simonnet. It is highly recommended by the Vatican as a sensitive portrayal of a very moving story that deserves a wide audience. Shot on location in France with outstanding cinematography and a beautiful music score, this is the film that was chosen to be shown daily at the shrine in Lourdes. Special Features include a film interview with actress Sydney Penny on playing Bernadette, audio interviews with Sydney Penny, & a collector's booklet. 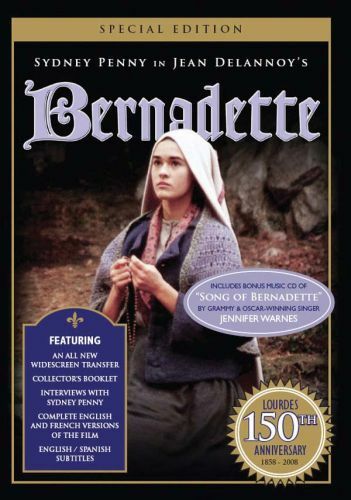 This saint movie also includes a music CD with acclaimed Song of Bernadette by Oscar and Grammy-winning singer Jennifer Warnes.